Living and hunting in southeast La. more often then not, when I go hunting it's usually raining, foggy or high humidity. Previous to last year all of my rifles were safe queens, purchased or given to me for keepsakes. 2012, I started deer hunting with my nephew. It's not unusual to bring a rifle home that has been exposed to rain and some times a little mud. My usual maintenance measure does not seem to be cutting it. Last year I used LPS 2 or 3 ( 1 is a lubricant the other is anti corrosion, I use the anti corrosion formula). After generous application I still found the beginning of rust spots. This year I changed up. Treatment starts with wiping the gun to get rid of visible moisture and mud/debri, then applying a generous coating of 3 in 1 oil, still this treatment seems inadequate. After a few days reapplication is an absolute must. I have also tried to wipe moisture/debri away, spray with a very heavy coat of wd40 to displace the moisture. Leave the gun hanging barrel down until all the wd40 drips off, then apply 3 in 1 oil. This has cut down on the problems. Has to be a better way. I have gone by cabelas and a few other gunshops. What I have found is a hundred different products all promising a cure. Rather than spend all my money on 1 product after another, figured I'd ask the experts. I would like a one step product, after wiping the gun clean, apply the product and into the safe she goes. Rem-Oil on the actions and Ezz-zox on everything else. Do you keep a dehumidifier in your gun cabinet? No I don't have a dehumidifier, I did at one time have a large container of silica gel, it worked fine on stored guns. But the guns going in and out getting wet doesn't seem to help. Golden rod going to look it up see if I can get one. Look into M Pro 7. This is what I use. Watch this video and subsequent test videos comparing M Pro against the other popular products. Here is the 2 mo test results. I also keep an Evadry in my gun cabinet. 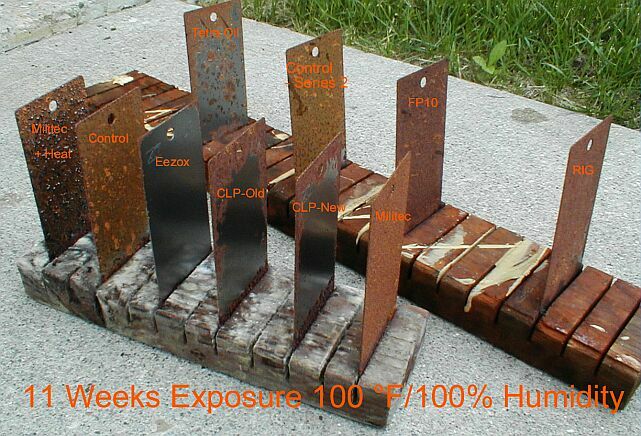 twentynine, we use CLP and Rust Proof and have not had any problems. Although a fool proof solution to the salt marshes of Pecan Island is still a mystery. If you have a bead blasted finish then it takes a little more wiping than a polished finish to make sure each little depression is cleaned and protected. After you wipe away the mud, dirt, moisture, finger prints, etc you need to let them warm up and dry off before putting them away, probably giving them a final wipe before doing so. If you do not let them normalize the cold metal will condense the moisture in the air similar to how a ice cold glass sweats. PS: storing a well oiled gun in a sheepskin lined gun case is also VERY effective. The sheepskin wicks the moisture away. and a link to the product. Sell enough of the guns you have so you can buy a stainless rifle and polymer stock. Not only will rust become a non-issue, but accuracy will improve. High humidity affects the POI on most wooden-stocked rifles. I may get some grief over this.............but I have used ballsitol for years now. IMO, there is only one gun oil, G 96 triple action gun treatment. A gunsmith friend turned us on to it 20 years ago. I've tried almost every other brand at one time or another, I now buy G 96 by the case. Ask around at your local gunstores, and I'd bet you'd be surprised how many are using it. No, I have no affiliation with them, just a satisfied customer. I'll throw TW25 into the mix. I second this, a great product! Eezox is what I use on my guns and I go sea duck hunting all season. If I get no rust on my guns after saltwater spray or dunking then it should do the trick for you. Also used it on all my "Gun Shop" guns, wipe them down once delivered and put on the rack, no worries even after being handled by the customers.